The Astrodome is the world's first indoor stadium. It started a new generation of indoor stadiums such as the Superdome, Skydome, Silverdome, and the Alamodome. It was first opened on April 9th, 1965. It can hold up to 70,000 people which makes it one of the biggest stadiums in the world. It is currently home to the Houston Oilers and the Houston Astros. The type of field that these two teams play on is called "Astroturf". Many great Oiler football stars have played in the Astrodome; legends such as Earl Campbell, Warren Moon, Ray Childress, and Ernest Givins. 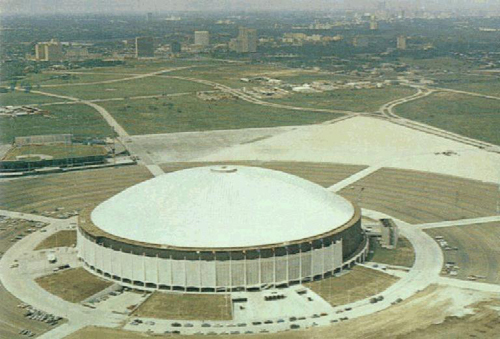 The Oilers first started out playing in Jepessen Stadium then Rice University before moving on to the Astrodome. Although the Oilers have had very good teams and many good years, the Oilers have never quite made it to the Super Bowl. Now, the city of Houston is trying very hard to keep the Oilers from moving to Nashville. "Looking for an NFL stadium with an intimate atmosphere, good visibility, and hair-raising crowd noise? Welcome to the Eighth Wonder of the World, the Harris County Domed Stadium - popularly known as the Astrodome. You could also say it's the Mother of All Domes, since it was constructed in 1961, long before the arrival of its closed-top offspring in New Orleans, Pontiac, Seattle, Indianapolis, and Minneapolis. This fact has earned the stadium yet another moniker - "Astrodome. The Original." Like many elderly NFL venues, the Astrodome has been spruced up in recent seasons to provide better amenities and expanded seating. Most recently, in 1988, 10,000 seats were added to satisfy Texas' football hungry fans - capacity is now at 62,439. A new football only AstroTurf system was also installed, making the Astrodome the only artificial-turf stadium in the USA with entirely separate fields for football and baseball. This was the fourth time that the Astrodome has received a new rug. All Texas football fans are sophisticated when it comes to the Science of the Pigskin, and Oilers fans are certainly no different. While the fans go wild when the Oilers "do the right thing" on the field, they can become boobirds at the drop of a pass. 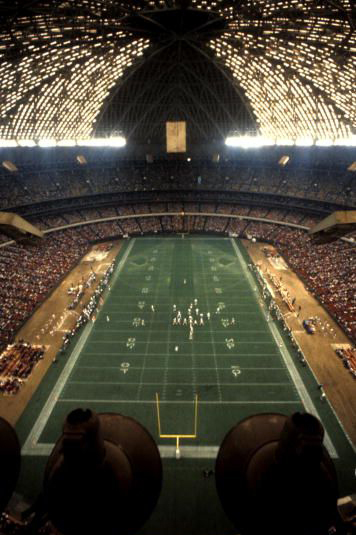 Games at the Astrodome remain a pulsating experience for everyone - players, coaches and fans. Sometimes the place can get so loud that the dome feels about ready to blow off." October 23, 1996 by Ira Miller, Chronicle Staff Writer - ". . . The Oilers are not the first NFL team to move in recent years and they probably will not be the last. They haven't even left town yet, and voters are being asked to approve a referendum in two weeks that would appropriate $200 million to fix up the Astrodome for a prospective future football tenant. Bud Adams, the Houston oilman who owns the Oilers, wanted a new stadium, not a renovation. Whether a fix-up would have satisfied him or not will never be known for certain, because, last year, Houston officials said there was no money for it. That's when Adams made his deal with Nashville. But his lease at the Astrodome runs through the 1997 season, and Houston Mayor Bob Lanier is holding him to it. The Oilers are expected to play the 1998 season in Memphis while the Nashville stadium is being completed. Even Adams, who says,"I'll be in Houston until they bury me," is surprised his team still has such a following in Texas. After the Oilers beat Atlanta 10 days ago, he predicted a crowd of between 25,000 and 30,000 for the Pittsburgh game. Nearly double that many showed up, and that underscored one of the reasons Adams longed for a new stadium. While the Oilers were playing the Steelers, in their biggest home game since 1993, Astrodome USA, which is owned by Astros owner Drayton McLane Jr. and runs the Dome, scheduled a low-riders convention, and a kick-boxing tournament and a gem and jewelry show at Astrohall and Astroarena next door to the Dome. That meant parking spaces were scarce for the football fans, who had to line up to buy their single-game tickets. Another reason Adams got fed up with the Astrodome: Only 18,000 of the 59,969 seats are between the goal lines. Even in the Oilers' best days, sellouts were tough because the last few thousand tickets available always were really awful seats. . ."
October 31, 1996 - Houston owner Bud Adams says both publicly and privately that the Oilers will not try to buy out their lease in 1997 in order to move to Tennessee sooner. Some people believe Adams is saying that to try to induce Memphis interests to pony up the money to buy out the lease. The Oilers would play in Memphis until their Nashville stadium is ready in 1999. In any event, Houston Mayor Bob Lanier says he won't negotiate a buyout. November 6, 1996 - The tuesday referendum approved $200 million to update the Astrodome to help attract another NFL team to replace the Oilers, who are moving to Tennessee. Febraury 21, 1997 - The Oilers and Houston city and Harris Country officials are close to signing off on a deal that would let the team out of the final year of its lease and play this season (and next) in Memphis, before moving to a new stadium being built in Nashville. Houston, Texas - The credit crunch has not killed the effort to turn the Astrodome into an upscale convention hotel, but the project's developers and county officials are unsure whether financing for the $450 million plan can be obtained. Before the financial markets tightened, Astrodome Redevelopment Co. was prepared to put up $150 million in equity - much coming in the form of historic tax credits given for preserving the iconic building once known as the Eighth Wonder of the World. But the company likely will be required to raise as much as $225 million in equity because loan standards have become stricter said Astrodome Redevelopment president Scott Hanson. The company is waiting to see whether the Texans and the Houston Livestock Show and Rodeo sign off on a proposed lease between it and the county before it tries to obtain financing. But before it could even seek financing, the company would also need final, detailed construction drawings prepared for the 1,300-room hotel, Hanson said. But Edgar Colon, chairman of the Harris County Sports and Convention Corp., which oversees Reliant Park, said progress continues to be made, and he is hopeful that Texans and rodeo's concerns can be addressed. Houston, Texas - The Astrodome will not host the rodeo's nightly country-western dances next month, or any other special event for that matter, as city code violations that would cost millions to remedy threaten to keep the doors shut indefinitely. With finances tight and the 44-year-old Astrodome's future undetermined, the county is unlikely to invest much in the building any time soon, several county officials said. That inspection and a follow-up inspection by the city fire marshal's office identified about 30 problems, including malfunctioning sprinkler and fire alarm systems. Those violations are considered life threatening, so the fire marshal could have ordered the building shut down. Instead, the county voluntarily relocated the three dozen employees of the management company that runs Reliant Park who had offices there and agreed not to host any public events. Addressing many of the other violations - which include roof leaks, problems with restroom ventilation, and the size and location of handrails - would mean restoring the building to a condition where it could hold NFL games and rock concerts just like any other stadium, Loston said. Such events are not necessarily in the Astrodome's future. Susan McMillian, an executive staff analyst in the City of Houston's Department of Public Works & Engineering, said standards are based on what the building is designed to be used for, not how it currently is being used. However, most of the inspection would be based on codes in place when the stadium was built in 1965. 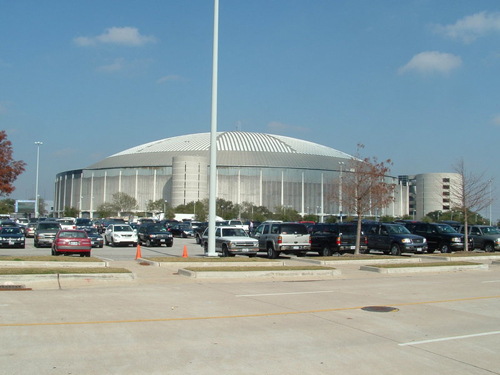 The dome's future has been uncertain since Reliant Stadium opened next door in 2002. Many residents oppose razing a structure long billed as the "Eighth Wonder of the World," but a proposal to convert it into a luxury hotel has faltered amid financial snags. Houston, Texas - Harris County residents are still paying debt on the Reliant Astrodome, even though professional sports teams have long left the venue. Estimates say the remaining debt is about $48 million, but because of various refinancing, the exact amount is unclear. Debt and interest payments will amount to more than $2.4 million this year, according to a payment schedule for the higher debt estimate. The Astrodome's manager estimates it also will cost $2 million for insurance, maintenance, utilities and security. The debt likely would have to be reckoned with in any deal to redevelop the Astrodome, said Willie Loston, executive director of the Harris County Sports & Convention Corporation, which the county created to run the Reliant Park complex. But no deal to restore what once was known as the "Eighth Wonder of the World" is likely to be affected by $32 million, Loston said. "Practically anything that would be done with the building would be some multiple of that," Loston said. "It's not enough to make or break a development proposal." The dome's debt could take another turn with the construction of a new stadium proposed for the MLS Dynamo. That plan creates a redevelopment district that includes the Astrodome. Fixing the Astrodome is not the purpose of the district, but a surge of development in the area could make the Astrodome more attractive as an investment and destination, according to development officials. There are no specific plans on what to do with redevelopment money in the Astrodome district or even an indication that any of it will be spent on the old stadium. County officials say it is not likely that redevelopment money would be used for Astrodome debt payments. Astrodome expenses are covered by a combination of hotel and car rental taxes, parking fees and concessions. Houston, Texas - Harris County officials are reviewing three plans for the Astrodome's future, according to the Houston Chronicle. The plans range from razing the facility to turning it into a new arena and hotel or an entertainment venue that would include a planetarium and movie soundstage, the newspaper said. Willie Loston, executive director of the Harris County Sports and Convention Corporation, which operates the county-owned Reliant Park complex, told the newspaper that the price tags for the Astrodome could range from $100 million to demolish the Dome and replace it with green space to $500 million for a full-fledged, revamped Dome, financed in part with non-public money, that could offer entertainment and technology options for tenants. The master plan, and the three options for the Astrodome, would be in keeping with Harris County Judge Ed Emmett's charge that the county should adopt a plan for the Astrodome's future by the end of the year, the newspaper said. How that plan would be put into action, however, is still undetermined. * Reliant Park Plaza plan: Raze the Dome for $128 million; replace Reliant Arena and make other improvements to park; build a hotel (with no public money) with as many as 1,500 rooms. Total price tag of $873 million. * Astrodome Multipurpose: Gut the Dome and add a new level of floor space, a science and technology center, a planetarium, solar panels on the roof that form a world map for $324 million to $374 million; keep other elements of plaza plan. Total price tag of $1.08 billion to $1.13 billion. * Astrodome Renaissance: Multipurpose plan plus add more Astrodome features, including conference space, a series of interactive exhibits that would allow users to simulate space travel and deep sea exploration, museums, an alternative energy center and a movie studio. The Astrodome portion would cost $588 million. Total price tag of $1.35 billion. Mark Miller, general manager of Reliant Park, called the last option "the dream picture," and said, "This is where we would like to go with the property." But Miller and Loston said their presentation is just the beginning of a conversation about the park's future. The decision will be closely watched by the Houston Texans and the Houston Livestock Show and Rodeo who are also tenants at Reliant Park. Texans owner Bob McNair told KRIV television that he has concerns about a major hotel or meeting center at the park which could pose problems when football games or rodeo events are scheduled. "Nothing can be booked in the park for any kind of conventions, or what have you, until we get our schedule because we have first priority," McNair told the television station. "We have paid for the right for the use of the stadium. We don't get the schedule until April of each year. "Conventions are booked two, three, four, five years out. So how in the world would you ever book a convention that's going to be three or four years down the road when you aren't going to know what the football schedule is until April of the current year? So it just doesn't work." Loston said the Sport and Convention Corporation will not recommend to county commissioners which plan, if any, to approve. The county spends about $2.4 million annually on debt and interest, plus an estimated $2 million in insurance, utility and other maintenance costs. Houston, Texas � Harris County officials have ordered a new study on the future of the 46-year- old Astrodome, the Houston Chronicle reported. "We have to make a decision" on the Dome, County Judge Ed Emmett told the Chronicle. "I wanted us to make our decision this year. They're going to look at every option there is and come back with the recommendation. It's about time we do that." The county will contribute $50,000 toward a $500,000 study, bringing to $100,000 the total the county has spent in the past two years studying what to do with the aging Houston icon. The remaining $450,000 for the latest study will be funded by the Greater Houston Convention and Visitors Bureau, Houston Livestock Show & Rodeo, Houston Texans, Harris County-Houston Sports Authority and Aramark Corp. The study, slated for completion in December, also will plot the future of the entire complex, home to the vacant Dome, the Texans' Reliant Stadium, Reliant Center and aging Reliant Arena. The county contributed $50,000 to a 2009 review that laid out several options for the Dome. That effort was too preliminary to be considered a "study," Willie Loston, executive director of the Harris County Sports & Convention Corp., which oversees Reliant Park, told the newspaper. * Raze the Dome and clean up the site for roughly $78 million, not including the debt the county still holds on the building. * Install a new floor, a planetarium and science, technology, engineering and math center with solar panels on the roof in the form of a world map for a total of $324 million in public funding. * Do all that and add conference space, interactive exhibits to allow users to simulate space travel, an alternative energy center and a movie studio, also for $324 million in public funding. Those cost estimates need updating, Loston said. Other ideas for the facility have called for it to be converted to a hotel and convention center or a movie studio. Some even suggested it become the Dynamo's home. Other ideas - such as a "minimalist" approach outlined by Emmett in this year's State of the County address to turn the Dome into an indoor event space - will be studied, along with ideas generated by the study consultants, CSL/Populous. The county spends about $2.5 million annually on the Dome's debt, plus an estimated $1.7 million in insurance and utility costs, county Financial Services Director Jack Yuran told the Chronicle. The facility does not have a city occupancy permit. Bringing the facility into full compliance with city codes could cost $30 million, Loston said; covering the bare essentials to make limited use of the building could cost $2 million. Emmett said he hopes to put a bond election on an option for the Dome to voters next year. Also studied will be the future of Reliant Arena, the oldest sections of which were built in the 1970s, Loston said. Maintenance costs there have been accumulating in recent years, he said, with millions spent to repair a bad wall and the roof. One plan on the table would see the arena razed and the exhibition space lost in the demolition made up as an addition to Reliant Center. A stand-alone arena then would be built nearby.